The proof and revision of a 85K word novel (as I’m doing now) means what? It means reading it over and over again and marking it up. A relentless approach seems to be best for me, but it is quite a bit of work. I can understand why some publishers don’t want to do it anymore. Sorry, someone must do it! I guess that means me. I wait a few minutes. This is a good time to pour another cup of coffee. Then, coffee cup in hand, stare out the window. There is usually a helpful squirrel available to keep me entertained. Suddenly, time’s up. Now view it on my Kindle, either the iPad software version, or my actual Kindle device. These devices have survived Luddite rages intact and proved their worth. Have I proved my worth to them? I believe I have until my next OS update to do so. On the iPad, I use Kindle’s good markup and highlight capabilities to make edit notes. 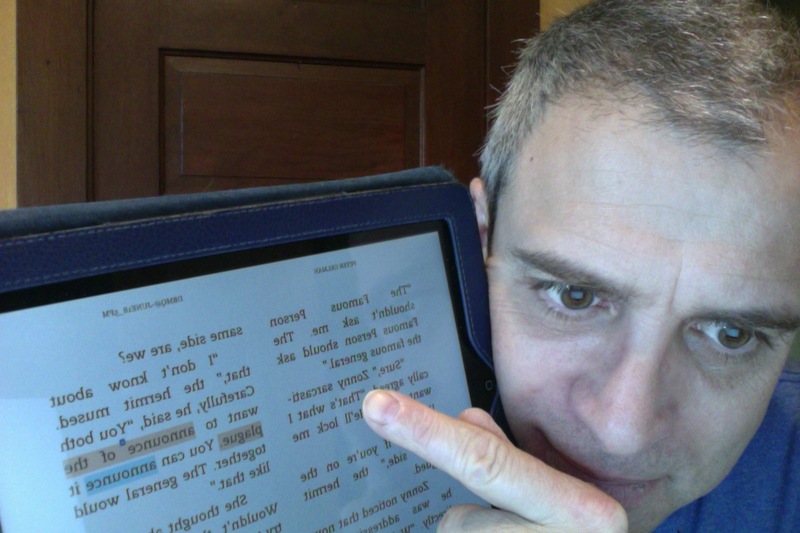 Sometimes I have the Kindle device’s robot narrator read along as I read and make notes. The robotic voice is an old friend by now. He sounds like a robot version of a Ken Burns documentary narrator. There is a twang in his voice that tells me he has attended a robot game of night baseball in robot Kansas. Where are my real friends? Why don’t they volunteer to take on this job? No, Sisyphus rolls his rock alone. That issue aside, the steady robot voice keeps me moving along, not too fast and not too slow. Hearing and seeing the words gives me two ways of noticing things I want to change. Kindle highlighting ability allows 4 different colors and a note-taking in the form of an annotation attached to a little blue icon in the text. You can use colors as “tags” for type of problem. Perhaps every reference to a geographic feature I wanted to confirm on a map I could tag yellow with a swipe of my thumb. I could tag repeated words in a paragraph blue, typos red, prose that needs revision orange. The colors are a quick and simple way to remind myself what I need to address when I come back to it. But typically it is enough to simply highlight the area for fixing. This is easier and more convenient than leafing through a stack of loose papers printed in water-soluble ink, trying to decipher my cuneiform symbols. The new tools help. Do I need to apologize to those who still prefer a quill pen, and grind their own ink in mortar and pestle? As they write their olde time long “s” with the antique calligraphy of an exuberant “F”, do they not realize the damage they do? Does not the “s” written as a wild “F” render the foundational Bill of Rights of the USA overly stimulating to schoolchildren and encourage their disobedience? I do not want that on my conscience. Ugh! It is not the joyous life of a lawyer, running from lunch to courtroom in pleated suits and fancy briefcases with glamorous she-lawyers. If I had a particular idea to revise a sentence, I could use my thumb (and indeed would, regardless of the luddite controversy) to add it as a note. Perhaps my note is asking me to check to make sure the color of the character’s pants does not change between chapters. Usually I only need to type in a few key words (or less) I need to remember the idea. Once I complete the Kindle editing of my manuscript, I heave myself up on hind legs. Then shuffle in my torn neolithic slippers back to the kitchen. I drink more coffee, staring out the window, measuring the progress of the arboreal rodent fellows. Then I shuffle with bulging eyes to the chrome hyberbaric chamber where my writing desk lurks, blinking and humming in a wreath of steam. The four legged office assistances spring and leap into their dutiful positions! They lift their heads a little in greeting. I prop my iPad beside my iMac and coordinate my views on the manuscript. This is not the type to think “Needs more adverbs, more gerunds.” Discipline! Find your notes. Coordinate your documents. Here’s where a good “Find” feature helps in the software editor. The Kindle app does as well. In fact, when click the search icon, it will show you a separate list of all your notes and highlights. Edits done, I do not relax. No, I must roll my rock up the hill again. I drop the manuscript on the “Send to Kindle” icon, then climb uphill from my desk to my couch. Then I manfully lie on my couch and read. Hey, I’m working! I read it again. Let’s hope the errors are fewer! I try not to change the color of the character’ pants, but sometimes, the muse calls. The muse calls. What is the next step? Alas, Sisyphus, you must repeat. But no, I shall mention it! Starting to let go of Microsoft Word as a primary tool! And moving to Plain Text with something called Markdown. That is a vast topic which I will try to examine in a future posting. Me, I don’t speak for heaven, but for earthly writing work the answer is: not at all. My writing routine changed recently when my chief office assistant fell sick. Although screened for Feline Leukemia, it turned out Phineas had it from birth. As the vile retrovirus switched from latent from active, he weakened. It was only then we learned what was happening to him. For all the while, he was valiantly making his rounds, continuing his duties supporting me. He had a few weeks to live. I happened to have flexible responsibilities just then, so I could stay by his side for his remaining weeks. Some of that time he chose to take his post on my writing desk, or in my home office window. He would lie heavily on his side, eyes open, watching birds. Of course, this home hospice care was sad and difficult. Aside from some obligations, I did not care to do much writing. I did, however, think about it. When he chose to lie in a patch of sunlight on the floor, I would sit next to him with my iPad and read. As I thought I was assisting him with my company, he was *still* assisting me. It was difficult to read for pleasure, so I ended up reading about the Cloud and how I could integrate it more into my writing life. This was Phineas’ last gift to me as my writing assistant. Without his gentle disruption of my habits, who knows when or if I would have taken time from my usual concerns to explore these developments? Although already a DropBox and GoogleDocs user, I hadn’t yet realized how Cloud infrastructure had integrated to give writers significantly new ways to work using Cloud, desktop computer and mobile device. These Cloud storage devices can provide more than just floating copies of files. I don’t know if this is internet 3.0, 4.0, or 5.0, but something has changed. There are new options, and good ones. I will write more about that later. Phineas supported me to the last day, feverish and weak, but still trying to help me. After two days, medication failing, his temperature rose to 105.9F. He chose to spend his last hours on my writing desk. With loving mercy, we said good-bye. He was not quite six years-old.